Sometimes I feel like I have no friends. Or, let me clarify, no real friends. It’s not that I don’t have nice conversations with other people, or get invited to hang out in groups with them. Instead, I think that people only ask to hang out with me because they really enjoy hanging out with my boyfriend (and just are unluckily stuck with me too). Or I think they are talking with me just to be nice to me, but don’t actually care about me or my interests. So it more or less feels like I have a ton of acquaintances—like I’m surrounded by happy people who can get on just fine without me in their lives. It’s hard, too, when you see other people on social media hanging out and sharing happy moments in their friendships, or when you hear stories about the things other people did (and quite obviously you weren’t invited to participate in). When it seems like you are surrounded by everyone having these awesome fun times and everyone else being friends with each other, it can feel very isolating and lonely. I don’t always have this feeling, though. I have found that these and other negative thoughts tend to creep in and magnify whenever I’m feeling down and stressed out. But when I’m in a good mood and have my stress under control, I don’t find that I’m troubled by any perceived lack of friendships—instead, I feel pretty good and optimistic about the relationships that I have! This is all not a coincidence: feelings of loneliness often go hand-in-hand with depression (which I have), and can often be fueled by anxiety (which I also have). Making friends when you are dealing with depression can be difficult. This blog here has some great tips, such as joining support groups/interest groups, making healthy decisions, and taking the friend-making process slowly (all, of course, while also continuing with your depression treatment!). But what do you do when you in fact have a friend network, but your depression starts to make you feel like you are isolated and friendless? Recognize that the feeling comes from the illness of depression, not reality. Living with a mental health issue doesn’t mean eliminating your symptoms, but rather managing them when they arise. Being able to acknowledge when something is a symptom of your mental illness—such as feeling no one truly likes you—can help to remove the power of that symptom! Ignore social media. SOVA has published many blogs on how we represent ourselves on social media, and how these representations are not always accurate at describing our lives. Remembering that social media posts are often just carefully chosen snippets of someone’s life (and possibly an inaccurate representation of what is happening) can help you to work at not comparing your friendships/relationships with others’ social media presences. Another option is just to ignore social media altogether for a bit! Give yourself a value-oriented definition of a close friendship. 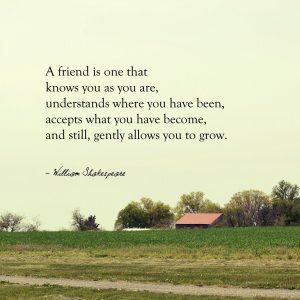 What is it that makes a close friend to you? Part of the problem is that, culturally, we don’t have a great definition for a close friendship the way we do with other types of relationships, such as romantic partners. Still, there are some common themes seen in how people do tend to define close friendships! We often interact with close friends over multiple contexts—for example, they are not just someone we share one class with, but may also interact with in an after-school activity, extra-curricular group, family function, etc. In addition to shared interests and activities, close friends are often people who are well-trusted and who can be confided in. Finally, close friends respect each other and encourage each other to be better/enjoy life more. Recognize situational changes in friendship dynamics. Our friendships and relationships can change over time, especially as our priorities and those of our friends change. For example, moving to a new school or new part of the country, caring for a family member, and increased job responsibilities are all factors that can take away from our ability to be close in friendships and can modify the close friendships that we do have. We often have little control over these factors, but identifying that they have come into play can help you to avoid blaming yourself. For example, the statement “They don’t talk to me anymore because I’m not worth being friends with” can become “We aren’t able to be as close as we once were, but I still think of ___ as a good friend”! Do you ever feel lonely, or like your friends aren’t close friends? What do you do if you get these feelings? Let us know in the comments below! Next story Does Your PCP Screen You For Depression?